†Present address: N.A.S.A. Lewis Research Center, Cleveland, Ohio. The reflectances and transmittances of antimony deposits on Al2O3 film substrates have been measured for the 4–140 μ region. 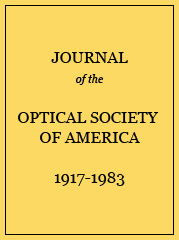 The optical and electrical constants for this wavelength region have been evaluated from those measurements. The lattice dielectric constant and the relaxation times for the electrical carriers in antimony have been derived from the change in the electrical properties with wavelength. Hall coefficients and electrical resistivities for antimony deposits. a R0 is the Hall coefficient extrapolated to zero magnetic field. Optical constants at selected wavelengths of antimony deposits. Electron and hole conductivities for antimony deposits. a The conductance of this sample indicates that the thickness is probably 470 Å. Relaxation times for the carriers in antimony deposits.